Combination photo of the four huge billboards. A picture paints a thousand words and a billboard could melt a thousand hearts!- Just recently, thousand of Filipino ELFs (Everlasting Friends), the enthusiastic Super Junior fans which is Korea’s most famous boyband went in such frenzy staring and taking pictures as well as videos of their biases, the heartrobs Lee Dong Hae and Choi Si Won. In response to the ELFs’ constant support and love for the Korean cuties, the biggest clothing brand here in the Philippines have given the opportunity to get them closer to their Pinoy fans with advocacies to save mother earth. That area at EDSA Guadalupe-Boni overlooking the Pasig River had been a home of Bench’s famous huge billboards in a way that it is located in a national prime road where commuters from north and south of Luzon exchange their ways. Former billboards gained so much attention because of their size and motorists tend to focus on them while on the road that it is considered to be an indicator of fame when a certain celebrity had his face on such giant billboards. I and my ELF friend got a glimpse on a night time. We saw lots of ELFs there indicating we are not alone and it is so much happy seeing them exchanging smiles while taking pictures of their idols overlooking the Pasig River. 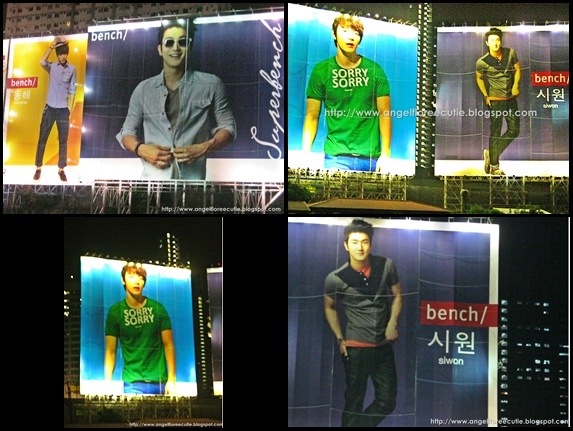 My favorite one was that of Dong Hae wearing that green “Sorry Sorry” shirt, he looks like a doll and that of Siwon wearing a combination of grey and red top in the right. Pasig River may look polluted and dirty in some way but for the ELFs, it is such an enjoyment just sitting in there enjoying the visage of their well loved Super Junior biases. Filipina ELFs enthusiastically taking pictures of their beloved biases.